It’s a week since Paradise was Lost. I wanted to recap on what we think we know thus far and what’s next. At about 6:15 AM last Thursday (November 8th), Pacific Gas and Electric electrical sensors reported a fault in a line near Camp Road. At 6:33, a fire was reported in the area of this fault. Whether the fire caused the fault in the electric line or the line caused the fire will be determined first by investigators and secondly in some as yet to be filed lawsuit on behalf of victims. It was a windy day. The wind was blowing from the mountains into the valley. Before noon that day, the city of Paradise—population about 28,000 souls—and the surrounding area were burned to a crisp. By sunset, 70,000 acres had burned. The lands to the west of Highway 99 are agricultural and thus a natural barrier to further spread of the fire in that direction. Much of the area is used for rice production. Maintained lands have less fuel available to be burned. Also, the growing season is over and fields are traditionally plowed and left fallow during the winter months. As of this writing, 142,000 acres have burned, 63 people are confirmed dead and over 600 are listed as missing. Most of the missing are elderly and were likely indoors going thru their regular routine when the fire struck their homes. They were not warned in time or unable to escape the flames. Authorities searching through the blackened aftermath of California’s deadliest wildfire have released the names of about 100 people who are still missing, including many in their 80s and 90s, and dozens more could still be unaccounted for. For readers not familiar with this area, this part of northern California is rural and poor. Unemployment is chronically high. There once was a thriving timber industry in this area but it was run out of the area decades ago. Now, government is the only employer offering middleclass wages to most folks in this area. Paradise was the type of place folks could go to get more for their money in terms of housing. You could get a place with a view or at least some pine or oak trees on your property. Chances are that a house there had no sidewalks and is on a septic system not connected to a city sewer. Many driveways are gravel not paved. The pace of life is slower than the big city and folks like it that way. The rural lifestyle is part of the reason for the loss of life. Another is that communication with citizens is more difficult in today’s society. We get our information from a varied and decentralized network of sources. In the wake of the political season, how many of you would answer a phone call from a number that you don’t recognize? If the sheriff’s office called me with a warning, I’d probably let it go to voicemail. We all know telemarketers can spoof the name and number of the call so caller I.D. has limited effectiveness. Plus old folks might not answer the phone because they didn’t hear it ring. Anything short of a welfare check on your neighbor had limited effectiveness. Many people were heading to work or school when the fire struck Paradise. People didn’t know who was home and who was not. Often they didn’t have time to check on their neighbors. Often they grabbed the car keys and left with nothing. Today, the south and east sides of the fire continue to burn. 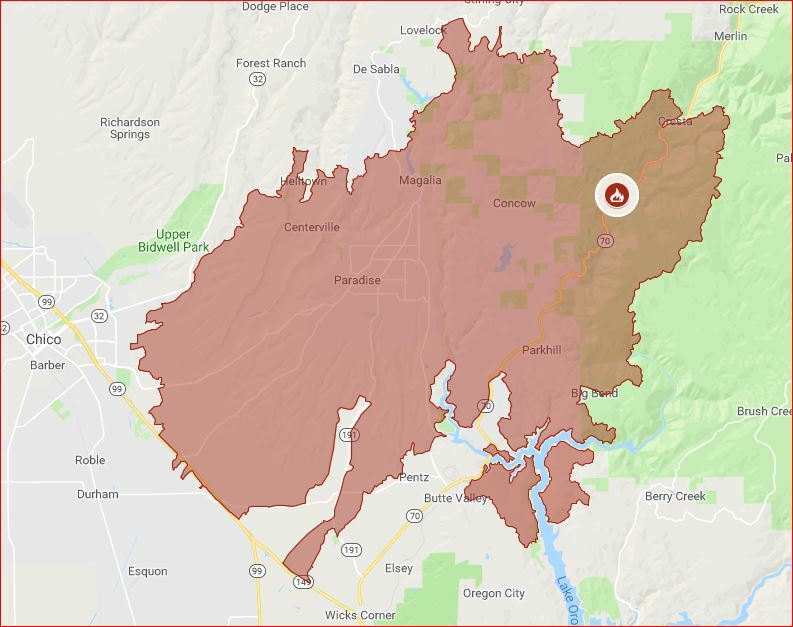 The area near Highway 70 and Oroville Lake is inaccessible and contains lots of fuel so it will be a while before this part gets firm fire lines. · Roads must be cleared and burned structures must be removed and disposed somewhere. · Land must then be surveyed to mark property boundaries. · Basic infrastructure—power, water, and sewer—must be restored before structures can be rebuilt. Concurrently, communication is also necessary whether that be cellular or land lines. · FEMA, CalOES, and insurance companies must get all their paperwork organized so money will be available to rebuild. · State, county, and local officials need to find a way to fast-track permits for all this to happen and of course winter is coming. Unless you opt for a mobile home, you are probably a year or more away from occupying a rebuilt house. Even with insurance, who can afford a year in temporary housing waiting to get their life back? I know people that have lost everything short of their lives in the fire and others that were evacuated and still don’t know if they have a place to return to when they are able. I have more to say on this tragedy but I will refrain until a later date. Meanwhile my heart goes out to those suffering loss. Let the smoke be a reminder that whatever inconvenience you think it is causing, it’s nothing compared to what people in Butte County are experiencing now.